Being relatively new at home bartending, cocktails both interest and intimidate me. They look cool and, when mixed well, taste great; but if you don't have the right ingredients, you can't try new things. Unable to find a good guide for how to start a personal bar past the very basics, I wrote a little Python application to help me to figure out what bottles to buy to get the most "bang for the buck." 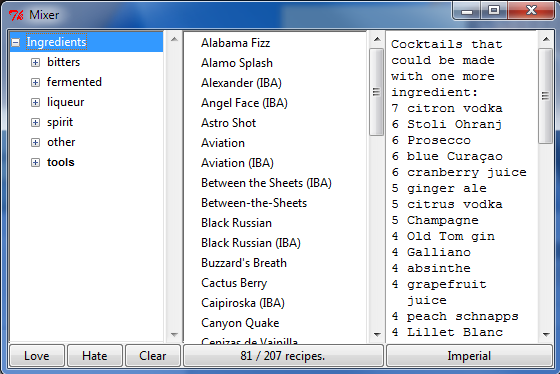 The application takes a comprehensive list of ingredients, a folder of recipes, and a list of the things currently in my bar inventory, and returns suggested cocktail recipes (and new bottles to buy). 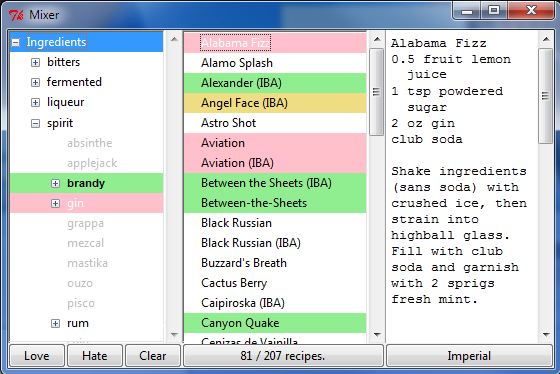 Other features include the ability to tag affinity (love/hate) for particular ingredients, which allows drinks to be highlighted accordingly. This project was fun not only as a means to an end, but also because I got to contribute to an open source library and learn about git when I found and fixed a bug.